It is of the utmost importance to be in the right space within myself to give a Tarot Reading. I have a beautiful room where I meditate to become quiet and centred. I ask for help from Great Spirit and then concentrate my mind and energies upon the person who has requested a reading from me. I have several different packs of cards and use whichever pack I feel drawn to. I often use a selection of packs to give an email reading and will lay the spreads out one on top of the other, separating each spread with a piece of silk. I use a number of different spreads in my email tarot readings: I like to start by giving a general spread with the Rider Waite Tarot and then pick out other cards from my Angel, Fairy, Egyptian and Animal Packs. I use a five card spread, to answer a specific question and find this extremely accurate. The Tarot Cards speak a symbolic language that is understood by the intuition. 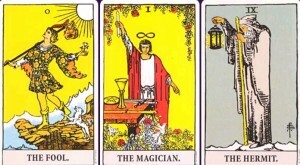 My logical mind gathers and sorts the intuitive information into concepts, which are then converted into another symbolic language – that of words, to be communicated in writing to the person asking for the Tarot Reading. Reading back over this post written when I first set up this site over 18 months ago, I have changed my style of giving a reading somewhat. The three step process remains the same, but now I go on an inner Journey (a Shamanic practice) to ask my question and then lay out about four or five cards still asking the same question. I interpret the cards in the light of the symbolism and information I have received on my inner Journey. I find this a fascinating, informative and enlightening way of giving a reading.